After getting the new Sharkwave fly line off you on Anzac Day went up to Frying pan and started fishing about 4.30pm. Fairly windy but picked up two rainbows just before dark. One about 2.5lbs the other 1.5lbs. Fished well into the dark but no action. Got up early on Saturday morning and the wind already pumping straight down the Frying pan arm, found a small patch of discoloured water on the lee side of a point. Got broken off once then landed the brown in the photo. 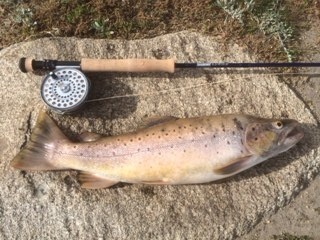 All fish took a Taihape Tickler on a number 8 hook,bead head nymph as dropper had no results. New line was a dream to cast in the wind. Mark Steeden Holding some nice fish and Dave Goodwin with a nice 2kg brown.